As a brief recap, the original ThunderX was an improved version of the Octeon III: a dual-issue in-order CPU core with two short pipelines. The advantage of the original ThunderX design is that such a simple core can be very energy efficient, especially for "low ILP" (instruction level parallelism) workloads such as web servers and most database servers. 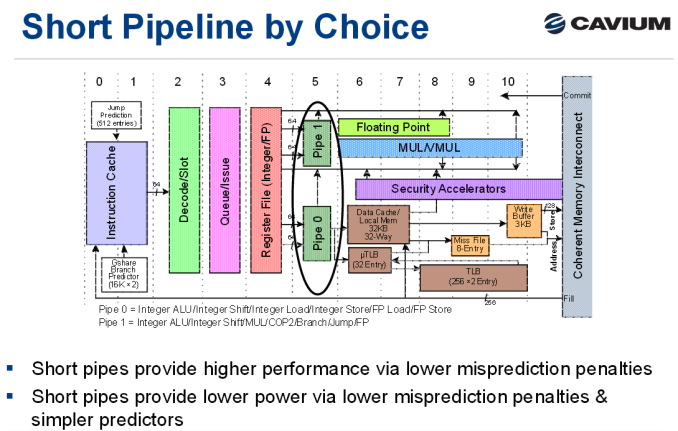 Of course, such a short pipeline limits the clockspeed, and such a simple in-order design offers low single threaded performance in medium and high ILP workloads, whereas more advanced out-of-order processors can extract significant parallelism. Relative to the original ThunderX, the Vulcan core of the ThunderX2 is an entirely different beast. 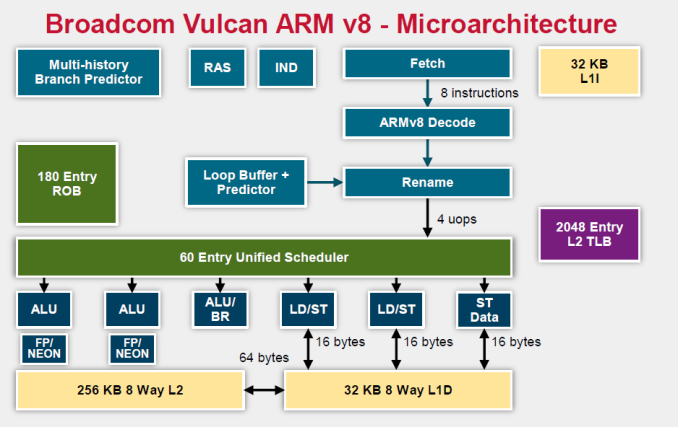 Announced in 2014 by Broadcom, it is a relatively wide core that runs 4 simultaneous threads (SMT4). As a result, the wide back end should be quite busy even when running low-ILP server workloads. To make sure that all 4 SMT threads can be sustained, the ThunderX2 front-end can fetch up to 64 bytes from the 8-way set associative 32 KB instruction cache, which is outfitted with a simple next line prefetcher. However, fetching 8 instructions is only possible if there is no taken branch inside those 64 bytes. In that case, the fetch breaks off at the taken branch. That means that in branch intensive code (databases, AI...) the fetcher will get +/- 5 instructions per clock cycle on average, as one out of 5 instructions is a branch. The fetched instructions are then sent to a smoothing buffer – a buffer where the fetched instructions are held for decoding. The decoder will then work on a bundle of 4 instructions. Between the decoder and the rename phase each thread has "skid buffer" which consists of 8 bundles. So between the 4 threads up to 32 bundles (128 instructions) can be skid buffered at any one time..
Those 4 instructions – a bundle – travel together through the pipeline until they reach the unified issue queue of the scheduler. Just like Intel has implemented in Nehalem, there is also a loop buffer and predictor, which Intel used to call a "Loop Stream Detector". This loop buffer avoids branch mispredictions and contains decoded µops, which "shortens" the pipeline and reduces the amount of power spent on decoding. Overall, up to 6 instructions can be executed at the same time. This is divided into 2 ALU/FP/NEON slots, 1 ALU/branch slot, 2 load/store slots (16 bytes), and 1 pure store slot that sends 16 bytes to the D-cache. There is a small (Cavium would not disclose how small) L1 TLB for zero latency translation from Virtual to physical addresses. 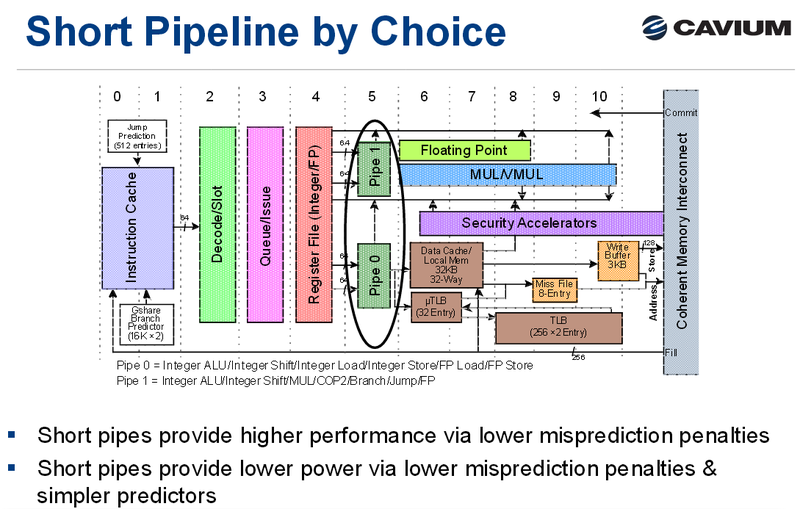 There is no hardware prefetcher for the L1 D-cache, but the L2 cache has a rather complex hardware prefetcher which is able to recognize patterns (besides being able to stride or fetching the next line). This is enough to feed the back-end, which can sustain 4 instructions per cycle from 4 different threads. Ultimately Cavium has only published a limited amount of information on the ThunderX2 cores, so there are some limits to our knowledge. But we've gone ahead and summarized some of the key specifications of the different CPU architectures below. 14 stage from µop cache 19 stages? TLB Data "Small L1" + 2048 unified L2 ? A detailed analysis is out of the scope of this article. But you can read Ian's analyses of the Falkor, Skylake and Zen architectures here at AnandTech. We limit ourselves to the most obvious differences. It is pretty clear that Intel's single-threaded performance remains unchallenged: the Skylake core is the widest core, keeps the most instructions in flight, and most importantly runs at the highest clockspeed. The ThunderX2 core is the one that fetches the most instructions per cycle, as it has to be able to keep 4 threads running. The fetch unit will grab 8 instructions from one thread, than grab 8 from the second thread and it will keep cycling between threads. A bad prediction could thus lower the performance of single thread significantly.